This retrospective tasting of 18 vintages of Bartolo Mascarello Barolos provided a great opportunity to revisit a number of historic vintages and also check in on some of the recent releases that have helped catapult this small, family-run estate into Piedmont’s upper echelon. 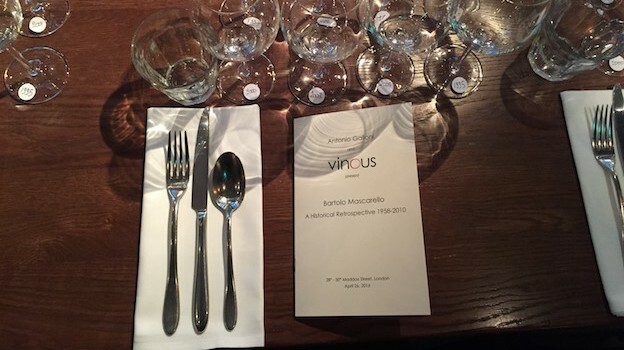 The Bartolo Mascarello vertical was the first part of a London double-header that continued the following day with an equally memorable vertical of Soldera Brunellos. 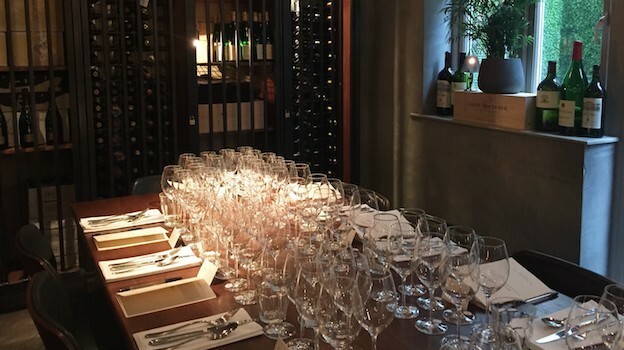 On this night, we gathered at 28° 50° Wine Workshop & Kitchen’s Maddox Street location in central London. The downstairs room was quite intimate, although frankly a bit loud and dark for my own taste. 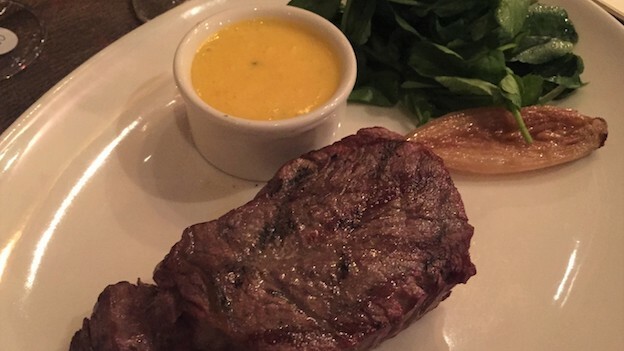 I thought the food was quite good and very wine-friendly, while the portions were more than abundant for an evening in which most of the glasses were emptied. The kitchen did a very nice job, which is never an easy task for a group such as this one. We opened the wines a few hours ahead of service and double decanted for sediment, which many of the older wines had. Naturally, choosing the vintages to show at an event like this one is never easy. In a perfect world, I would have loved to include the 1985, 1982, 1978 and 1964, among others. But even in the best of cases, provenance is very hard to guarantee with older wines and expectations are rightfully very high at Vinous events, so I chose a set of vintages that offered the best odds of success. All of the wines from 1988 through 2010 were purchased on release from the winery and stored in one cellar with one previous owner. The 1986 and 1958 magnums were purchased directly from the winery. Nestled just off Via Roma in the heart of the village of Barolo, Cantina Bartolo Mascarello remains a bastion of traditional, artisan values in Piedmont. Giulio Mascarello founded Cantina Mascarello in 1920. His son, Bartolo, started working in the winery in the 1960s. For the last period of his life, Bartolo Mascarello was confined to a wheelchair, but that never seemed to diminish his zest for life or passion for the issues that were near and dear to his heart. Mascarello spent his time overseeing the estate, designing the artist labels that have since become so coveted and writing on his favorite subjects. I have lost track of how many afternoons I spent in Mascarello’s office over the years talking about wine, politics and anything else that was on his mind, but the visits were always memorable. In the mid 1990s, Mascarello’s daughter, Maria Teresa, took on an increasing role in the family winery. Since then, Maria Teresa Mascarello has taken the estate to the very pinnacle of excellence, and frankly, to a level never previously seen here. Mascarello has built a world-class team around her and made subtle, but meaningful improvements, such as changing out old barrels, that have had significant positive effects on quality. A shy, reclusive grower, Maria Teresa Mascarello was not at this tasting, but her spirit was very much present in the wines. Cantina Mascarello owns Nebbiolo parcels in the towns of Barolo and La Morra, all of which have been in the family for two or more generations. Vineyard sources for the Barolo are Cannubi, San Lorenzo and Ruè, all in the town of Barolo, and Rocche dell’Annunziata, which is in La Morra. 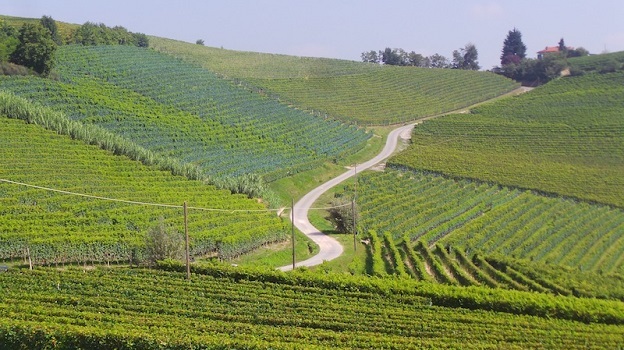 Mascarello also owns a number of other parcels planted with Dolcetto, Barbera and Freisa. Although Nebbiolo for Barolo is the most prized variety in Piedmont today, it wasn’t always that way. In the 1960s, Bartolo Mascarello acquired his two upper parcels in Cannubi by trading away a similarly sized parcel of Dolcetto to another grower who wanted his two Dolcetto parcels to lie in close proximity with each other. In other words, the price of hectare of Dolcetto was the same as the price of hectare of Nebbiolo (! ), something that is virtually impossible to contemplate today. The estate makes a single Barolo along decidedly traditional lines, starting with blending fruit from their four separate vineyards, a practice that was largely abandoned once single-vineyard Barolos became the rage starting in the early 1960s. Fruit from the four vineyards is harvested together and co-fermented, using only ambient yeasts. The young wines see at least several weeks on the skins, with the length of the post-fermentation maceration depending on the quality of the vintage. Mascarello gives the Barolos about two years in cask, which is pretty much the norm these days, but shorter than most traditionally minded growers preferred up until fairly recently. One of the most interesting aspects of this tasting was following the evolution of the wines over the decades. For a number of years, the knock on the Bartolo Mascarello wines was that there was a perceptible degree of bottle variation. That is certainly true of a number of vintages from the 1970s to the early 2000s. Bottle variation is also an issue between wines bottled in magnum and standard 750-ml format. Thankfully, Maria Teresa Mascarello has pretty much eliminated those inconsistencies. As always, there are a number of surprises in a tasting such as this, most of them quite positive. The 1988, 1995 and 2003 were all far better than I had expected. The 1989, and, to a lesser extent, the 1998, were the only real disappointments. All of the other wines showed more or less as I expected they would. As always, the wines were arranged in thematic flights rather than strictly chronologically, an approach I find makes for fascinating comparisons of vintages that might not be next to each other in order of vintage. The accompanying tasting notes are presented in the order the wines were tasted. The first flight is designed to prepare the palate with a collection of ready to drink vintages across various periods of the estate’s history. It’s hard to know where to start with vintages from a single producer. For this first flight I chose four wines I thought would be within their peak drinking windows. Mascarello’s 2000 Barolo is a wine I have not tasted in some time from bottle, but one smell is enough to remind me of what I found objectionable when the wine was first released. In short, the 2000 is riddled with brett and generally unclean flavors. Time has softened some of the harshness the 2000 showed when it was younger, but the flaws remain. For whatever reason or reasons the 2000 has always been better from magnum. The 2003 Barolo is one of many unexpected surprises of the night. From a period before quality really skyrockets at the domaine, the 2003 is remarkably fresh, perfumed and expressive. Naturally, the 2003 doesn’t match the level of the best wines on the table, but it is, frankly, much stronger than I had expected. The 2003 is also one of the best semi-current vintages for present-day drinking. Powerful and laser-like in its focus, the 2005 Barolo captures the personality of this often-overlooked vintage in spades. Bright red stone fruit and bright, mineral-laced overtones infuse a powerful, tightly wound Barolo that is still on the ascent. This is a terrific bottle. Another very pleasant surprise, the 1995 Barolo is absolutely singing. Dark tonalities of fruit and firm yet well-integrated tannins are some of the signatures. The 1995s have always been a bit burly, but the best wines from this vintage are now entering the sweet spot. That certainly applies to the 1995, which may be the best and most complete vintage of the 1990s to drink today. The 1995 is also the first vintage to be bottled with just two years in oak, as opposed to the three years that was previously the norm. Our second flight looks at four vintages in the late 1990s and early 2000s that are also in their prime drinking windows, with the possible exception of the 1999, which is still quite young. All of the radiance and warmth of the vintage comes through in the 1997 Barolo. Voluptuous and racy, with plenty of dark red cherry and plum pushed forward, the 1997 hits all the right notes. A rush of red cherry, plum and tobacco give the 1997 its luscious, creamy personality. This is a pleasant surprise. The 1998 Barolo, on the other hand, is one of the more problematic wines of the evening, as it is mature or close to it, with plenty of earth, leather, dried cherry and smoke overtones. In this tasting, the 1998 comes across as rustic and not especially polished. The comparison with other, finer, vintages proves to be quite revealing. I would prefer to drink the 1998 sooner rather than later. One of my favorite wines of the evening, the 1999 Barolo bristles with energy and classic austerity (in a good way) that are such signatures of this epic vintage. Laser-like in its focus, with bright flavors and bracing tannins, the 1999 is a textbook example of what traditionally-made Barolo in an important, structured vintage is all about. With air, the 1999 drinks well now, but it will continue to reward those lucky enough to own it for another two decades or more. The 2001 Barolo is solid, with good depth and plenty of richness, but it doesn’t quite reach the level of the best wines in this tasting, nor does it really appear to be one of the finer wines of the vintage. I expected a little bit more here. In particular, the aromatics lack focus. The fairly tale duo of 1989 and 1990 form the core of our third flight, with 1988 and 1996 as bookends. Once again, there are plenty of surprises. The 1988, 1990 and 1996 are brilliant, while the 1989 is less impressive than it has been in the past. I admit I have never really found much to admire in the 1988 vintage in Piedmont. Perhaps that is because 1989 and 1990 are both of such high quality, while 1985, 1986 and even at times 1987 are all more distinctive. With that in mind, Mascarello’s 1988 Barolo is a truly enchanting and seductive wine. Absolutely haunting in its beauty, the 1988 offers up a classic bouquet of dried rose petal, tar, anise, orange peel and bright red stone fruit, with the translucent, weightlessness that only Nebbiolo and Pinot Noir can deliver. Crystalline and pure, the 1988 has enough balance to drink well for another decade, even if it doesn’t have the sheer weight of some of the surrounding vintages. The 1988 is striking when it is first opened and it is just as beautiful several hours later. What a wine! One of the most anticipated wines of the night, the 1989 Barolo is not as exceptional as it can be. I have tasted the 1989 mostly from magnum recently, so perhaps my expectations are a bit colored. Even from the big bottle, though, the 1989 has always shown slight imperfections, especially in the bouquet. In this tasting, my impression is that in the standard bottle those imperfections are more evident. There is plenty of texture and depth to the fruit, but it is the aromatics that are penalizing here. The 1990 Barolo, on the other hand, is magnificent. Deep, powerful and intense, the 1990 still possesses exceptional density and all of the radiance of the warm, ripe vintage. The flavors are dark, bold and racy from start to finish. Quite simply, this is a super-impressive showing from the 1990. Another of the truly epic wines of the evening, the 1996 Barolo is sublime. Black cherry, plum, leather, spice and menthol give the 1996 its dark, brooding personality. Powerful, dense and super-appealing, the 1996 has enough depth to drink beautifully for another two decades or more. This is a fabulous example of the best the year has to offer. This flight of four relatively recent releases provides a tremendous opportunity to see the estate at its current level of excellence. Sensual, silky and totally alluring, the 2004 Barolo is another wine that is a picture-perfect example of its vintage. The aromatics alone are captivating, but it is the wine’s total balance that places it in the upper echelon. After some of the ups and downs of the 1980s and 1990s’ wines, the 2004 really shows where the estate is today in terms of quality. While the 2004 is a finessed wine, the 2006 Barolo is all brute power and intensity. Raw and explosive, with tons of underlying structure, the 2006 simply dazzles from the very first taste. With time in the glass, a host of dark, balsamic-inflected notes start to blossom. Even so, the 2006 is a wine to bury in the deepest corner of the cellar and forget about for at least another 5-10 years, as it is very much still on the ascent. What a wine. The 2008 Barolo is once again superb. The striking aromatics that are so typical of the year make a strong first impression. Delicate and silky on the palate, yet also deceptive in its mid-weight structure, the 2008 is pure seduction. A hint of grip from the tannins appears on the finish, but with some air, the 2008 is quite open. It will be interesting to see if the 2008 ever goes into a shell. Thus far, it has remained surprisingly open for a young Barolo from a cool, late-ripening vintage. Tasted from magnum. From the moment we put together this tasting, I knew the 2010 Barolo had to be in the lineup because of its historical significance. It is arguably the greatest wine ever made here. Although naturally very young, the 2010 is super-expressive and also one of the clear highlights of the evening. All the elements simply fall into place. The interplay of aromatics, fruit and structure is utterly captivating. In many ways, the 2010 represents a culmination of all the work Maria Teresa Mascarello and her team have done over the last two decades to elevate quality. The gentleman to my left tells me I made a mistake in my initial review and score of the 2010. I agree. Two pristine magnums, both purchased directly from the winery, round out a magnificent evening. The 1986 Barolo emerges from one of the most fascinating vintages of the last forty years. Devastating hail in May wiped out many vineyards and very few producers bottled Barolo. Most of the little wine that was reelased that year was made from tiny yields and the second flowering that followed the hail. A few 1986s were ultimately bottled but they languished under the shadow of the 1985s literally for decades. Both Bartolo Mascarello and Bruno Giacosa (who bottled a Red Label Riserva) told me they preferred 1986 over 1985. And so we arrive at Mascarello’s 1986 Barolo, a wine that, from magnum, captures all of the richness and intensity that the vintage provided all on its own. The 1986 here has always been a deep, muscular wine. That is exactly what comes through today. Mascarello's 1958 Barolo is another very special wine. I bought my first 1.9 liter bottiglione of this wine about a dozen years ago, during my honeymoon. The bottiglione is a traditional large format that was designed for aging, with the intent that the owner would eventually transfer the contents to two separate bottles and have a little bit left over to account for sediment. That particular bottiglione travelled with me quite a bit until I opened it a few years later. It was one of the greatest wines I had ever tasted up until that point. The Mascarello 1958 Barolo from the big bottle is not exactly the kind of wine one runs across every day. Over the years, time has softened some of the visceral intensity the 1958 showed when it was younger, while the aromatics have acquired striking complexity. Star anise, autumn leaves, sweet dried cherries and tobacco all give the 1958 its haunting, beguiling complexity. I would prefer to drink the 1958 sooner rather than later. At this point, the reality is that the wine’s longevity will be determined by the resistance of the cork rather than the quality of the wine itself. It would be a shame to miss the 1958 at this glorious peak of maturity.